Recently a friend of mine asked me to design a simple Uninterruptible Power Supply for Arduino using some handphone battery ( Li-ion) and handphone charger. I decided to use a TP4056 charger board to charge the battery, while using a P-MOSFET to control when will the battery provide power to a 5V Step Up Converter. The schematic shows the 5V from a handphone USB charger feeding a 5V Boost Converter, which powers an Arduino Uno. The 5V will also charge the Li-Ion via TP4056 board. 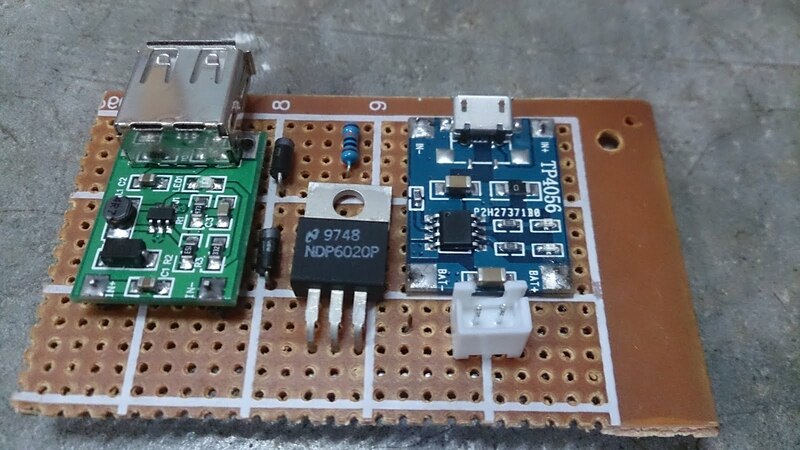 If the USB Supply is gone, the P-MOSFET will be switched on and the Li-Ion battery can power the Boost Converter. Anyway, the 2 diodes are 1N5158 , I forgot to change it on the schematic. I think the P-MOS can be eliminated because the 5V from the USB would have prevented the battery from supplying power anyway. This is my end result on a perf board. My friend says that it is working fine, at least until now. (I have no confidence in my design). I'm glad you like this. I have since then improvised the design. The P-MOS is not necessary. This is amazing. I would have never thought of building my own ups. Is this the best uninterruptible power supply maker online today? Thanks for sharing! Have you posted your improved design? No, I didn't really improve it, I merely removed the PMOS from the circuit as it serves not purpose. Could you share your improved design with us? Hi, I just wrote a new post about the new design. You can view it here.